I've never really been big on Pancake Day, mainly because I was never fond of them as a child, however the last few years I've grown to like them, and ever since moving into my own place, I've wanted to celebrate all the 'smaller' events such as Pancake day.. and this year was no exception.. When I spotted a competition run by Confused.com asking for creative pancake photos, I thought it was the perfect opportunity to.. er... go a bit wacky. And before you ask, no I haven't got children.. Although I wish I did (just for this one night!) because I'm sure they would have had a lot of fun eating this! This was my 2nd attempt (I originally did a spider with Cadburys chocolate fingers as legs eating a stack of pancakes, but a few days later created this one, which I much prefer!). It was quite time consuming but I'm fairly pleased with the end result! Chocolate chips to give the shark a more dark and dangerous colour! A sprinkle of blue cake sugar for added water effects. 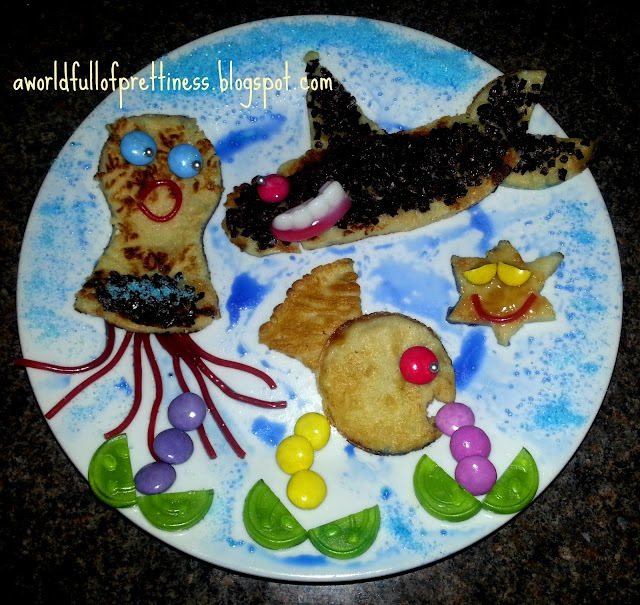 Did you make anything creative for pancake day? Join in with the competition if you did!